Place 3 pieces of burnt apricot into a cocktail shaker, add ice and Juno gin. Shake vigorously until well incorporated. Pour cocktail into wine glass and top with lemonade. Add the juice from half a lemon, stir. Garnish with 1 piece of burnt apricot slice and rosemary. Mix the apricots in sugar, cinnamon and salt. Allow to marinate at room temperature for a couple of hours. Heat a cast iron-pan until smoking or place on the BBQ until smokey and hot. Place apricots carefully and cook until the sugar caramelises darkly and each apricot begins to blacken. Store apricots in a jar for later use in your burnt apricot spritz cocktail. 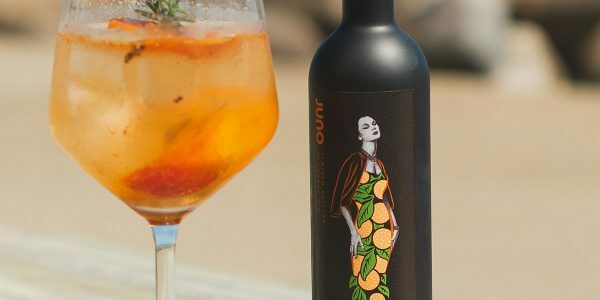 Juno’s Summer 2019 Gin is available in 200ml bottles here.